And then . . . I didn’t. Today I got an email from Intelligent Change linking me to this article and I decided, hey, start today. Start now. I’m guilty of that. I need to think of it like this . . . 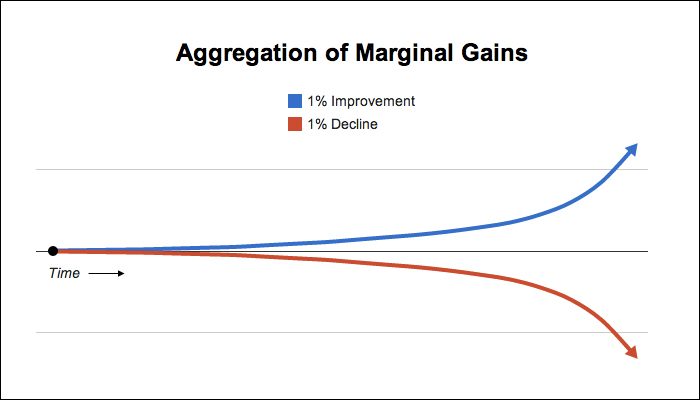 Improving by just 1 percent isn’t notable (and sometimes it isn’t even noticeable). But it can be just as meaningful, especially in the long run. One extra half-hour of quality sleep. Followed by 20 minutes of swinging a kettle bell. Followed by writing for 15 minutes. Small. But daily, I can beat depression and anxiety while focusing better at work and, generally, being happier (because of quality sleep). I can lose 10 pounds (because of a kettle bell routine). I can write a novel (because of 15 minutes of daily writing). Read this. I read it while eating at my desk and the sun is shining and happy Christmas music is playing on the overhead speakers and I decided to make a 1% improvement immediately. Hence. A 15-minute blog entry. Yay, me!